Taylored Expressions October New release has started! Woohoo! Today, I am excited to share new sneak peeks from Taylored Expressions October new release with you. 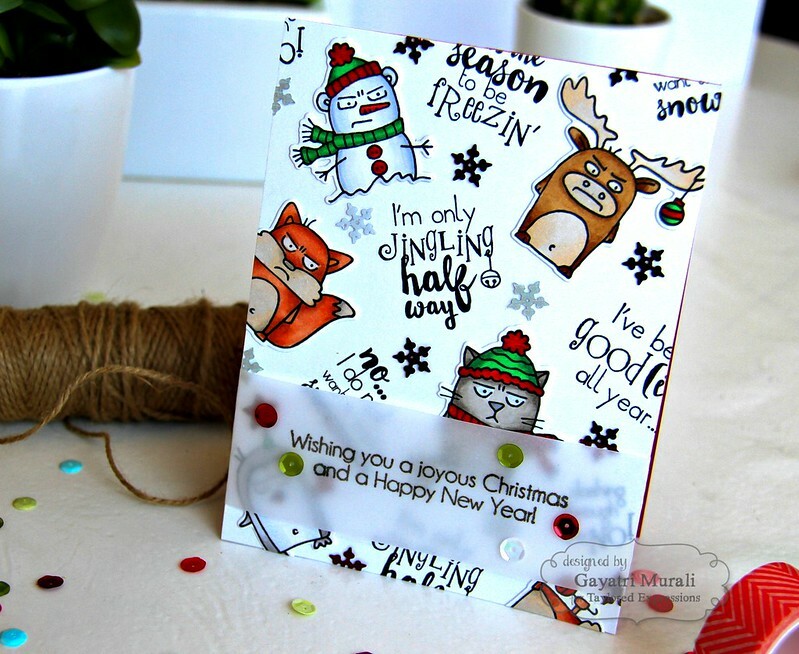 Today I am sharing a card using my favourite Grumplings stamp set. This one is called Holiday Grumplings. And the stamp set comes with coordinating dies are well. Yay! I love coordinating dies especially for outline images which can be coloured. Here is stamp set and dies for you. I started my card with stamping and colouring the Holiday Grumplings with copic markers. Then I used the coordinating dies to cut them out. On a white cardstock panel trimmed to the size of card front, I placed the grumplings randomly at different angles as a guide to stamp the sentiments from the Holiday Grumpling stamp set. Again I stamped the sentiments at various angles to give the random effect. I then adhered the adhered the die cut Grumplings using liquid glue (glossy accent). To fill in the gaps, I used the snow flakes sequins from Build A Scene: Christmas sequins also from the October release. I trimmed off the excess hanging out of the panel using scissors. The main sentiment is from In & Out Christmas stamp set also a new set to be released on Thursday. I stamped this sentiment on vellum using Versafine Black ink and clear embossed the sentiment. I then trimmed the vellum, wrapped it around the background panel and secured it at the back with some tacky tape. This panel is then adhered on to a Cherry Top card base. I accented the sentiment on the vellum with some sequins from Build A Scene: Christmas sequins. Taylored Expression is celebrating the release week with some fabulous prizes. Head over to Taylored Expressions Blog for more details on how to enter the giveaway. Also the blog has complete list of designers participating in today’s sneak peek and more information of the the new release products. 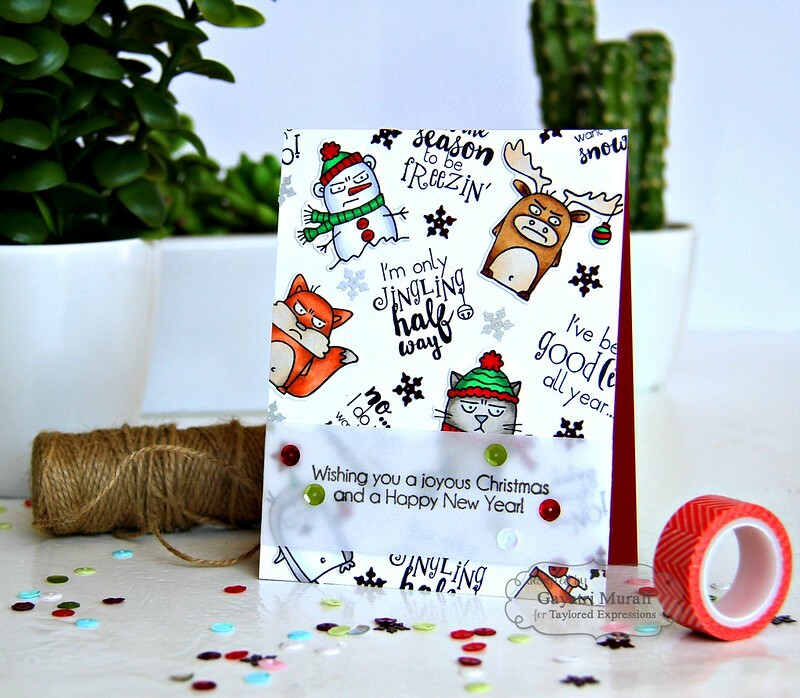 All the new release stamp sets, dies, pattern papers, kits, embossing folders will be available for purchase on Thursday at Taylored Expressions Store. Adorable, love this set, it's darling and your card is really sweet too!